It’s not a typo, nor a misspelling. Lumen is a measure of light. ARRT stands for Artists’ Rapid Response Team. LumenARRT! is a project (projection!) of the Portland, Maine based Artists’ Rapid Response Team in collaboration with the Union of Maine Visual Artists (UMVA) to advocate for artists and further the work of progressive non-profits in the state of Maine. LumenARRT! projects strong, clear, artistic images and messages addressing current issues at outdoor public events in Maine. It could be considered guerrilla art (think “electronic graffiti”), except that the group, considerate Mainers all, asks owners’ permission to illuminate their buildings. By necessity, their work is seen at night, when the LumenARRT! team aims their projectors onto building exteriors or screens. This is how Transformit got involved—with large white surfaces on which to project, many Transformit pieces are ideally suited to LumenARRT!’s work. The large-scale projections of LumenARRT! offer ARRT! and UMVA a unique medium for expression. 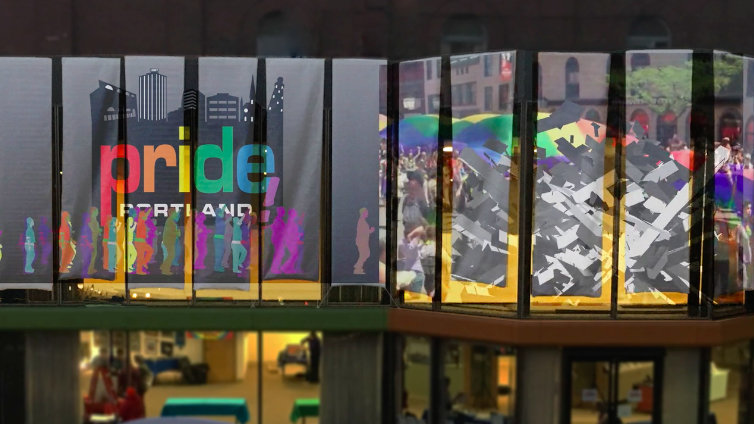 “Especially in Maine where billboards aren’t allowed,” notes Clearfield, “video projections add a dynamic voice to the landscape.” The scale is obviously one “wow!” factor — for instance, LumenARRT! projected video of immigrants talking about their experiences on a large granite statue in Portland’s Monument Square and on 15-foot tall Transformit Tangos. These gave monumental dimensions to the people and their stories. As for Transformit, we’ve been responding rapidly to artistic challenges for thirty years! In fact, our founder was one of the UMVA’s early members.